Revered Imam Sahib, Honoured Guests, Ladies and Gentlemen! Assalamu Alaikum wa Rahmatullahi wa Barakatuhu. May Allah make you all recipients of His peace, mercy and blessings. 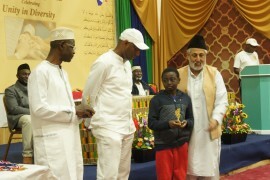 It gives me great pleasure to welcome you on behalf of the Pan-African Ahmadiyya Muslim Association UK. Your presence here today demonstrates your desire for social cohesion, and mutual understanding. We are grateful to you all for having spared your precious time to grace and honour us with your presence. 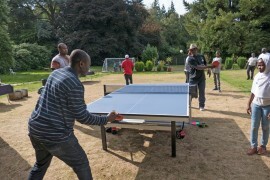 We hope and pray that we can host you in a most befitting manner and repay you with our hospitality. Most importantly, we hope and pray that today’s event serves the purpose for which it is being held and for which we are gathered here. 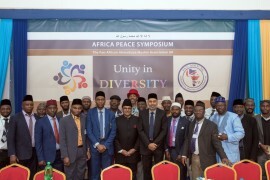 The Pan-African Association is a subsidiary association within the Ahmadiyya Muslim Community which, as is known to many, has as its motto the simple yet highly pragmatic modus vivendi, Love for All, Hatred for None. Those who are acquainted with us are well aware that the Ahmadiyya Muslim Community practices what it preaches and that whatever we say or do is based on true Islamic teachings. Today’s event is being held as part of our efforts to promote a better understanding of true Islam and to engender interfaith dialogue. Islam, as a religion, is alike misunderstood by many non-Muslims and misrepresented by some Muslims. Orientalists in pre-modern times and the media in post-modern times have painted a negative image of Islam while the actions of certain so-called Muslim groups have further bolstered these negative stereotypes. From September 11 to July 7, from Al Qaeda to ISIS, fanatical groups have unjustly kept the religion of Islam in the public consciousness and called into question its message and doctrine. This Question and Answer event today presents an opportunity for us to learn about the true tenets and teachings of Islam. We welcome your participation and look forward to a lively discourse. We are most fortunate to have with us today a scholar par excellence in person of Maulana Ataul Mujeeb Rashed Sahib, the longest serving Imam of the Community’s London Mosque, the first purpose built mosque in the UK. In addition to being an acclaimed speaker and writer, Imam Rashed is also the Missionary In-charge of the Ahmadiyya Missions across the UK as well as the Deputy National President of the Community. He has travelled extensively within the UK and indeed the world delivering lectures on Islam and religious affairs. We are honoured to have him with us here today and so, without further ado, I humbly request Revered Imam Sahib to deliver an address on an Introduction to Islam and to respond to questions from our guests. Thanks for having me. Wassalamu Alaikum.